The children have been very excited to help Mrs. Maryam garden outside any chance they get, so we decided to bring some gardening into the classroom! As a part of this indoor gardening endeavor, we planted squash, peas and sweet red bell pepper. We started off our gardening process by asking the children “What do these seeds need to grow?” The children responded with water, dirt, sun and air. These responses show that the children are taking their prior knowledge about plants, obtained from working in the outdoor garden, and applying it to their new indoor garden. The children then worked together to fill the holes, and put one seed in every spot. Along with this great display of teamwork, the children built their fine motor skills. Handling and planting the little seeds into the soil served as a workout for their hand muscles, increasing coordination and accuracy. In creating the garden, the children practiced mathematical skills through tasks like measuring the soil. Also, taking care of the indoor garden will require the children to work together to meet the daily needs of the plants. In doing so, they will establish new habits and learn the importance of building routines. 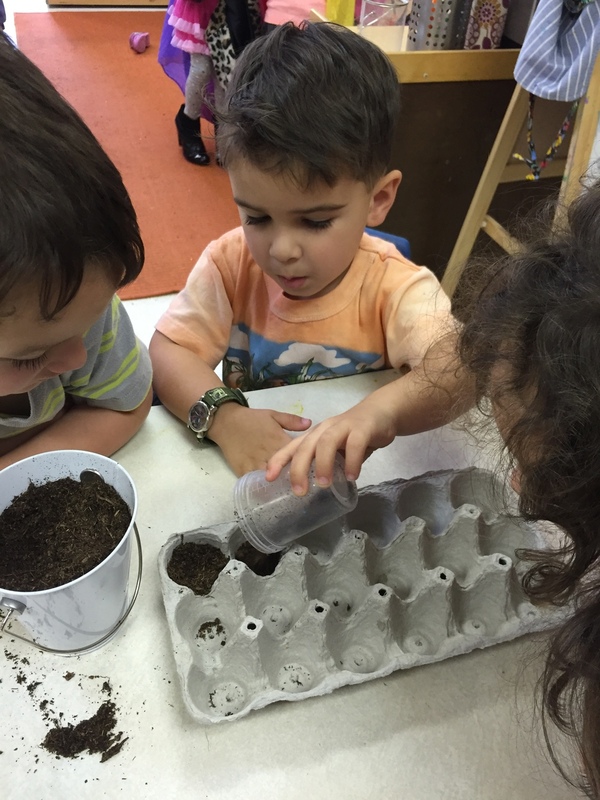 Having an indoor garden will also allow the children to more closely examine the plant growth process, make observations and hypotheses about each plant’s progress and practice other important scientific skills. Having this kind of fun and interesting encounter with plants furthers the children’s understanding and passion for nature, which will establish a sense of environmental responsibility and appreciation. We will check on the progress of the plants every week, and continue to water them daily.